^ David K. Stumpf. 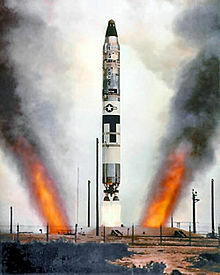 Titan II: A History of a Cold War Missile Program. University of Arkansas Press, 2000. ISBN 1-55728-601-9 (cloth). Pages 63-67. ^ Paul O. Larson. "Titan III Inertial Guidance System," page 4. ^ A.C. Liang and D.L. Kleinbub. "Navigation of the Titan IIIC space launch vehicle using the Carousel VB IMU." AIAA Guidance and Control Conference, Key Biscayne, FL, 20–22 August 1973. AIAA Paper No. 73-905. Larson, Paul O. “Titan III Inertial Guidance System,” in AIAA Second Annual Meeting, San Francisco, 26–29 July 1965, pages 1–11. Liang, A.C. and Kleinbub, D.L. 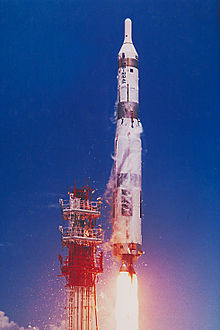 “Navigation of the Titan IIIC space launch vehicle using the Carousel VB IMU”. AIAA Guidance and Control Conference, Key Biscayne, FL, 20–22 August 1973. AIAA Paper No. 73-905.